The Highway Code (Rule 62) is pretty clear about segregated cycle/pedestrian paths. It says "you MUST keep to the side intended for cyclists as the pedestrian side remains a pavement or footpath", the MUST meaning that it's against the law if you ignore their sage advice. Cycle on the pedestrian side and you could, in extremis, be found guilty of 'careless or inconsiderate cycling', and fined up to £1000. So all you have to do is obey the blue sign. Such as this one (right), by Clifton Moor here in York. It clearly tells you to stick to the left-hand side. Except the painted markings tell you the opposite. So, whatever you decide, you've committed an offence. Follow the path round, off the north end of Water Lane through a housing development, and the painted signs do the neat trick of swopping sides at each end..
And what about pedestrians? They don't know where they stand. Literally. Though they'll probably stand in the middle, with their back to me, listening to their iPod. That's what they usually do. That cycle lane (whichever side it is!) is FAR too narrow for bi-directional use, especially with that wall and fence. 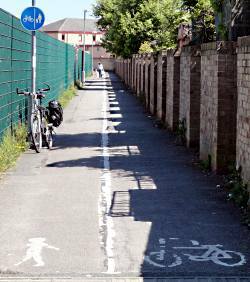 Read any cycle route design guidelines, and they'll tell you that. This route should be made shared-use, so people on bicycles can legally pass each other without having to dismount. Change the blue sign, and let the white paint continue to disappear. I always find this stuff kind of hilarious (as long as I'm not being fined, of course!). I travel with my bike pretty frequently, and you'd be surprised (or maybe not) how common this sort of thing is. Impossible signage, bike paths that run into a bus shelter/hydrant/fountain. You name it. It's out there. I've encountered this too. Along the North side of the A316 heading towards Richmond. As expected, the facilities are of the same standard as the signage. You must hand over your details to a Police officer when asked, not to do so is a serious offence, surely far more so than the one mentioned above. It's probably best to say nothing at the time, obey the painted markings and argue that the the sign must have been rotated by Youths. But you could point to the sign and the painted markings.